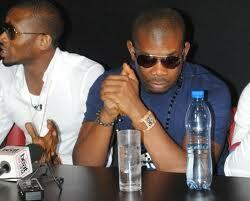 Rumours of a split between popular collaborators Don Jazzy and D’Banj are now being reported to be untrue. According to a report published by Ascology, D’Banj laughed off the news, saying that such rumours popped up at all times. Don Jazzy is also said to simply be out of the country on an “executive business trip”, as opposed to having moved out of the mansion they share at Lekki. Speaking to our correspondent in a telephone interview, Sunday Aare, manager of the Mo’ Hits recording outfit said “I spoke to D’banj earlier today about the incident when it came to my attention as I recently came back into the country and he denied anything as such, he jokingly even asked me if that’s the first time I’m hearing rumours about him and that he’s used to such gists”. “D’banj is a very outspoken person and I can assure you he speaks his mind even when not confronted, how much more when confronted, to my surprise D’banj, Wande and D’Prince were together in harmony at the time I met them’ he added. He also said Don Jazzy has gone out on an executive business trip on behalf of the Mohits family contrary to reports he has moved out of their Lekki mansion. A source close to the Mo’ Hits family also said “It is highly unthinkable for people to expect men in their 30s to stay together forever, that itself is against the norms no matter how reach you are, so if Don Jazzy moved out – though I’m not saying he moved please – why should anyone be suprised?” the source told Ascology News on condition of anonymity as he was not authorized to speak on Mo’ Hits publicly. Reports from media circles earlier today indicated that both D’banj and Don Jazzy splitted up in their bids for supremacy, financial control as well as allegations of disrespect and unacceptable lifestyle on the part of the Kokomaster D’banj.